Liposuction recovery is one of the major concerns for patients seeking liposuction. The idea of a painful or prolonged liposuction recovery can scare people out having liposuction surgery. Liposuction recovery can vary from person to person and will depend on many factors. It is important for patients to understand one of the major advances in liposuction over the last 30 years is the reduction in liposuction recovery. Gone are the days of patients being in hospital for many days for liposuction recovery. With modern technology and techniques we can minimize liposuction recovery not only in the amount of says but in the amount of bruising, pain, discomfort, and swelling. Patients should know their liposuction recovery will be proportionate to the size of the operation. They should also know liposuction recovery can be minimized by experts in liposuction and they should seek out surgeons who perform many liposuction procedures to reduce their liposuction recovery. A lot of liposuction recovery will be enhanced after surgery with post liposuction recovery treatments. 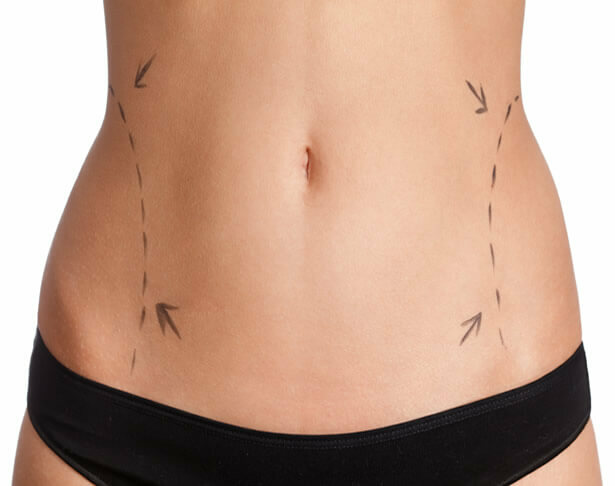 The majority of patients will have targeted liposuction and thus will have minimal liposuction recovery allowing them to return to work and exercise very fast. However, in my practice I perform major body contouring procedures. Compared to years ago the liposuction recovery process is shortened significantly but can still be up to a week after a major liposuction procedure. Below we outline all aspects of liposuction recovery in order to demystify the liposuction recovery process and answer any and all questions someone may have when they ask about liposuction recovery. The best way to reduce the liposuction recovery process is to set yourself up for success. The first thing your surgeon should discuss is your current medical conditions. For instance I would have patients who smoke quit for 4 weeks before surgery. Smoking can decrease blood flow in the important little arteries that are bringing nutrients to the areas of liposuction to help them heal. When people are smoking their liposuction recovery will be significantly delayed and they may even have some wound healing problems. Wound healing problems can be in the form of an infection, a blood clot, or a poor scar. The next condition in which your surgeon should optimize to reduce liposuction recovery is diabetes. When someone has diabetes all of the cells in their body do not work very well when the sugar is out of control. Some simple blood tests can tell your surgeon if your sugars are being well controlled. Having your diabetes under control will improve the function of your cells and will reduce your liposuction recovery. I also discuss nutrition and weight. Patients will have the best response to liposuction when they are close to their ideal weight. Sometimes we will have people placed on a medically supervised HCG diet to rapidly lose weight before surgery but overall we get people connected with our special nutritionists and dietitians for a plant based raw vegetable diet for 4-6 weeks before surgery to rapidly lose weight. This allows me to maximize contour going into surgery. Also, most patients when they lose weight and have surgery are so happy with their new body they find new confidence and inspiration to enhance their liposuction results with lifelong commitments to health and wellness. In terms of medications I will have patients stop all vitamins, minerals, and supplements a week before surgery. While these can contribute to health and wellness many of them interfere with bleeding. If there is excess bleeding and or bruising than the liposuction recovery will be prolonged. We also ask patients not to take Advil, Motrin, or aspirin containing products a week before surgery again to help speed up the liposuction recovery process. One thing that always comes up the 48 hours before liposuction is caffeine. I understand I am also someone who starts every day with a coffee or two. However, the effects of caffeine are not benign (that’s why we like it so much) and, as such, I ask patients to refrain from coffee for two days before surgery. The day of surgery should be a day of relief for patients. All of the anticipation is over and its time to start the liposuction recovery process. On the day of surgery in my office we make every effort possible for people to feel as comfortable and relaxed as possible. Also, we hold your hand every step. I really want patients to feel as if we have total control of every detail and all they have to do is show up to the office. We have a large waiting room for the families and loved ones and also are within walking distance of Manhattan’s best museums and restaurants so the families have a lot to do. ery aspect of the liposuction operation needs to be ideal for the best outcome and easiest liposuction recovery possible. To be a liposuction expert requires the best staff and equipment possible. The hospitals cannot accumulate the vast amount of technology and liposuction instruments we have in the office. Furthermore, other surgeons who specialize in things like nose and breast surgery also cannot accumulate this amount of equipment. Then it comes to safety. I have handpicked the best staff to ensure not only a comfortable environment but the safest possible environment possible. Patients appreciate the personal attention of the office rather than the sterile impersonal hospital. When I am giving courses to other surgeons around the world or teaching the local residents about liposuction I also teach “handle the tissues gently”. I always say “what you put in is what you get out”. Meaning if you are gentle with the tissues at surgery you can limit the amount of inflammation, which limits the amount of bruising and swelling which limits the amount of liposuction recovery. There is a lot of confusion about what liposuction is and what are the different types of liposuction. This confusion extends beyond patients as many surgeons have difficulty keeping up with all the different terms that are used to describe the operation. At its very core liposuction is simply removing fat from under the skin. In its basic form a surgeon will place numbing fluid under the skin directly into the fat to be removed. Once the numbing fluid has set in and the adrenaline or epinephrine (chemical used to limit bleeding) the surgeon will remove the fat using a cannula (looks like a straw) connected to a vacuum machine. This is the simple basis of liposuction. The problem with liposuction in this sense is that it does not provide the patient with the best result or easiest liposuction recovery. All different types of machines have been created to help with the liposuction surgery. Initially surgeons tried different types of energy machines to help melt the fat. The idea is that if the fat is melted it will come out with less effort from the surgeon and thus would be less traumatic for the patient. The earliest types of energy were laser and ultrasound. Laser was also known as smart lipo. The phrase smart lipo was just the branded name of the laser. It worked well but has fallen out of favor for newer liposuction equipment. Currently I feel the best way to do the procedure is to melt the deep fat using acoustic or ultrasound energy with the VASER platform. After the numbing fluid has been placed under the skin into the fat I go through the same incision with the ultrasound device and melt the deep fat. Think taking a stick of butter and putting it in the microwave. This should ideally be done in the deep fat. The idea is to remove the deep fat and leave fat under the skin so the patient heals with a smooth naturally lean look. I will use a power assisted liposuction device to actually remove the fat. I do this for a number of reasons. First because the cannula vibrates at the end I do not have to work hard at all to remove the fat. This means I can use very small cannulas meaning smaller incisions and scars and I no longer have to move my arm back and forth aggressively. Liposuction used to look like rock bands now it should looks like a symphony. Many surgeons will not get this device because it is very expensive but I feel that since I specialize in liposuction it is important that at every step of the process we have the best device possible. Once the fat is removed I will usually add something to ensure the skin will remain tight. The most advanced technology available is plasma technology. Plasma is actually ionized helium and acts like a cold flame. This device can be placed under the skin through the same small incision the VASER and the PAL was placed. All of this will contribute towards your liposuction recovery. The more energy used the more swelling and thus the more actively involved your surgeon needs to be in your liposuction recovery process. Recovery from liposuction surgery can be an emotional journey. My staff and I understand this and take it very seriously. Most patients are very excited when they book their surgery and naturally get nervous as the day approaches. Immediately after surgery people have a sense of euphoria. When the swelling kicks in (the bigger the procedure the more swelling) the emotional or psychological aspect of liposuction recovery becomes important. People may actually look larger than when they went into surgery during the first week. This is 100% normal and our staff will walk you through this. Some patients worry or feel guilty for having taken time, energy, and resources away from their families. Again, this is 100% normal in liposuction recovery. For this reason we have added aromatherapy and meditation to our lymphatic massage therapy program. Early in the healing phase our world-renown lymphatic massage specialist will see you in a cool calm environment for a scientifically proven gently rhythmic massage to remove the swelling and scar tissue. At the same time we have instituted data proven aromatherapy and meditation breathing techniques to help calm you. Most patients will do well and immediately get back to their daily lives but I think its important for people to know that we are here for them and have all the resources necessary to help them through their unique healing pathway from liposuction. We will also help the healing process by using the best possible compression garments available. Marena medicals patented 4-way stretch fabric ensures comfortable fit and superior medical-grade compression. These garments last longer and retain their shape, staying softer and more comfortable through extended wear. Marena brands are FDA registered, ISO certified, and made in the USA with our exclusive patented fabric. The compression garment will be on for one to four weeks depending on the number of liposuction areas during your liposuction recovery. Our massage therapist also has a number of special gadgets, garments, oils, devices to help with any lump or bump that may come up during the healing process. Since I am obsessed with liposuction and providing the best results possible my staff and I will be actively involved in the healing process with very open and fluid lines of communication. I want to know everything that is happening to expedite people into the final healing phase. We help liposuction recovery with some pain medication and anxiety reducing medications. We do use antibiotics for a few days but the incidence of infection is incredibly rare. You will find my teams obsession with your results and clear cut genuine interest in you to be unique but I am happy to say we are a niche unique practice aiming to be the best liposuction/body contouring practice anywhere in the world.